Coffee and beignets are fine, but if you have them in New Orleans at Café Du Monde, it becomes a marvelous treat. Café Du Monde Coffee Stand in the French Quarter (c. 1862). Paul Goldfinger photograph on a Sunday morning, early. © Click to enlarge. The French brought coffee to the New Orleans area around 1700. In the 1800’s, during a coffee shortage, chicory was added. The Cajuns came from Nova Scotia in the 19th century and brought beignets with them. 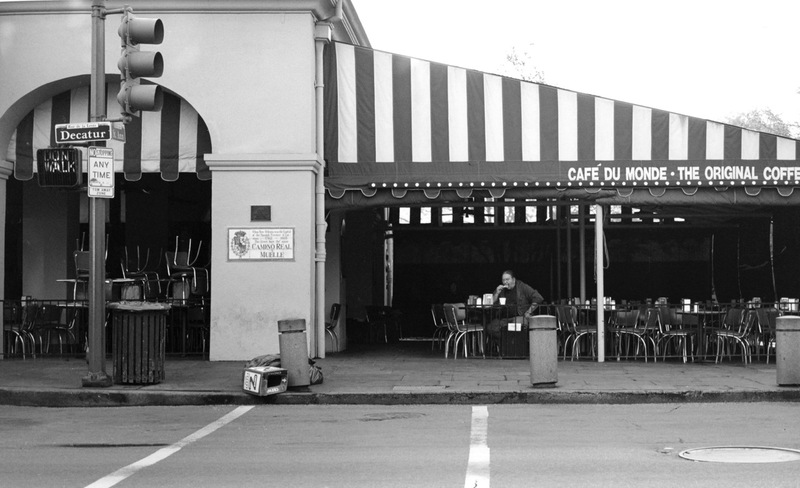 Café Du Monde on Decatur Street has been around for about 150 years. If you visit NO, you must visit the Café. It is open 24/7 and is always busy. The scene is livened by street musicians and characters. The photo above is unusual, because there was only one person chowing down on a Sunday morning. I guess Saturday night on Bourbon Street took its toll. The menu is very limited featuring beignets (donuts without a hole, served hot and covered with powdered sugar.) The coffee is dark roasted and served black or with milk (au lait). They also have hot chocolate and fresh squeezed orange juice.